Happy Birthday Masculine Card using Wild Whisper Products! Hello! Hope you've all had a wonderful weekend! We celebrated my husband's birthday on Friday and I made this birthday card for him using some wonderful supplies from Wild Whisper! I layered the beautiful papers from the Focus On You 12x12 Paper Pack in the background, using more of the masculine colours in the collection, and stamped the camera and feathers from the Focus On You Wild Whisper Stamp Set using a gradient ink pad. I love that you can use all the elements from these paper packs - and the strip of cameras at the bottom of one of the patterned papers was perfect to add as a border along the top of my card! I added a sentiment from one of the Tim Holtz chit chat sticker packs and used my Dylusions Paint Pens to add some hand drawn stitching lines. I fussy cut around the feathers and then popped one up with foam dots when I got them layered they way I wanted. I added a bit of Stickles for bling - cause every birthday needs bling! Then, I topped it with some gorgeous sequins and a cork star from SpiegelMom Scraps as well as some of the Focus On You sequins, which were designed exclusively for Wild Whisper by SpiegelMom Scraps! They coordinate beautifully with the collection! Here's a Project Life page I made with the PL App! If you want to try the recipe for the Pumpkin Spice Bread that I used to make Mike's gluten free cake you can find it HERE. Thanks so much for stopping by. I hope your weekend was fantastic and you got some time for yourself! Kitty Bee Designs - Snow Bun! 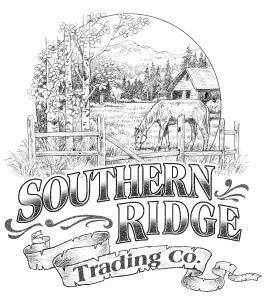 Howdy crafty friends! I'm back today to share a cute little winter snow bunny card using the Snow Bun digital stamp from Kitty Bee Designs. We are set to get more snow this week, and I figured I might as well enjoy what's left of the season! I coloured this super sweet image in with Hobby Colour and Prismacolor Markers and added some white gel pen highlights and Stickles before cutting him out with a Spellbinders Nestabilities die and my Cuttlebug. I am really loving purple lately, and I was excited to use this pretty paper from a Heartfelt Creations paper pad - Celebrate The Season. It has lots of gorgeous blues and purples, and even though there are wonderful Christmas images in it, there are also lots of snowy winter papers and images. I fussy cut out the mittens and skates and used the papers from the pad. I sponged Distress Inks around the edges and used my sewing machine to stitch around my layered papers. A few pretty sequins from the SpiegelMom Scraps Plum Dreamsicle sequin collection, a bit more Stickles and a couple drops of some Silver Nuvo Drops add some bling! Inside, I used a stamp from my stash and another strip of that beautiful paper! Thanks so much for stopping by! 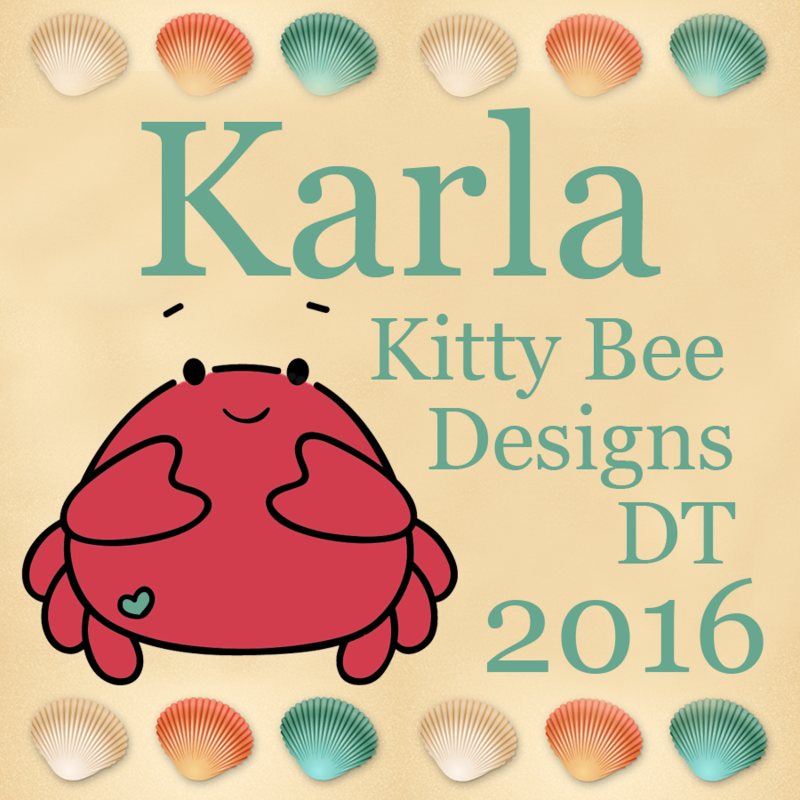 Be sure to check out the Kitty Bee Designs store HERE and the Kitty Bee Designs blog HERE for lots of adorable images and sweet ideas on how to use them! SSS Monday Challenge - Transport it - Use your skates to get around!! Hey there friends! I'm really happy to be back posting on the Pretty Cute Stamps blog again!! It's been a while, and even though Lisa is not going to have regular blog hops and releases like before, she will still be creating new and fun digi stamps now and then. 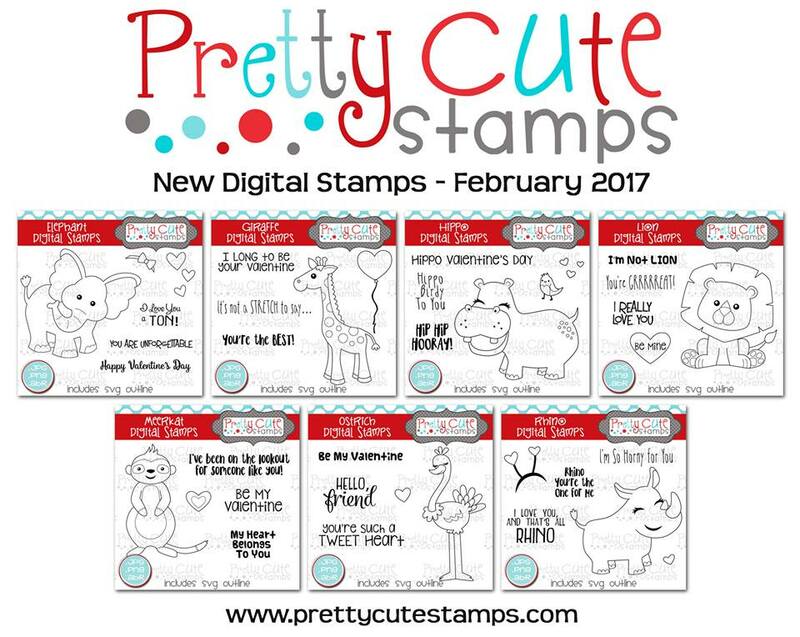 And, of course, you can still find all her digi and clear stamps at the Pretty Cute Stamps store! In case you missed the adorable new animals she released earlier this month, be sure to check them out - they are super cute!! 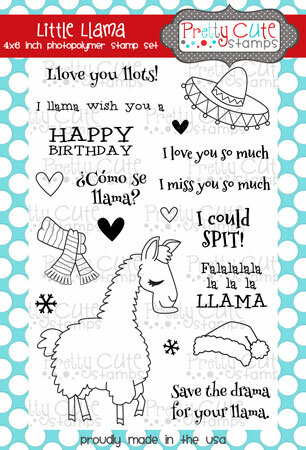 Today, I'm sharing a cute llama birthday card that I made for my daughter, Amie, using the Little Llama clear stamp set. She turned 10 in January and made a special request for this llama wearing a sombrero to be on her card! I used my Prismacolor and Hobby Colour Markers, which are alcohol based to colour in this adorable llama and her pretty hat, which I popped up with foam dots. I thought I'd use the fun and festive BoBunny Believe papers from a 6x6 pad along with some pretty sequins. I layered the sentiment from the set over a banner shape and added some hand drawn stitch lines. Inside, I used the Happy Birthday sentiment and a couple hearts from the set - and since I forgot to take a pic before writing a sweet message to my girl I thought I'd share that with you too! I always make sure I add the date in the card so she'll be able to see when she got it. Here's a look at this super cute set - with lots of sentiments for different occasions! Thanks so much for stopping by today! I hope your week is looking fabulous!! For my project this week I've created a couple pocket pages with some winter photos, Simple Stories Snow Fun paper and embellishments, the Winter Frolic Cricut cartridge and of course sequins from our awesome sponsor SpiegelMom Scraps!! A few weeks ago the Free Cut Of The Week in Cricut Design Space was the Winter Frolic cartridge. I cut a whole bunch of diecuts and put them together all at once. It was a lot of work, but now I have a whole bunch of winter diecuts that are all ready to go. I was able to grab two snowmen for the first page and pop them on easily. After figuring out where I wanted my photos and the cards from the cut apart SS paper I started adding my embellishments - some stickers from the paper pack, some washi tape and sequins and cork from the SpiegelMom Scraps collection. I find it easiest to add sequins by placing them on my page and moving them around until I feel like they look great. Really, I don't think you can go wrong with bling ;) And, I just got a new Pick Up tool, which is awesome! so I can then pick them up one by one and put a drop of Glossy Accents underneath. I find adding 2 or 3 embellishments in a cluster in a couple different areas always looks pleasing. For my second page I used the sledding diecuts and more embellishments. I even added some washi and sequins right on my photos! This adorable heart sequin was in a valentine mix and looks great added to my journaling card. Even with a few different sequin mixes there is such a variety that you have a great selection. I used a date stamp and a paper embellishment to add the date to my page. I find it makes it so much easier when I'm putting pages away in my scrapbooks to already have the date on it! Thanks so much for stopping by! I hope things are warming up a bit wherever you are - and that you have a wonderful week. 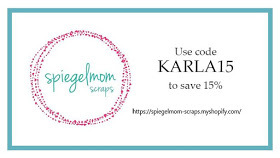 Be sure to head over to the Fantabulous Cricut Challenge Blog to see all the awesome sequin projects our Design Team has come up with - and give our awesome sponsor SpiegelMom Scraps some love!! 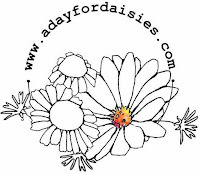 You can find their Facebook page here and their blog here with lots of amazing inspiration! 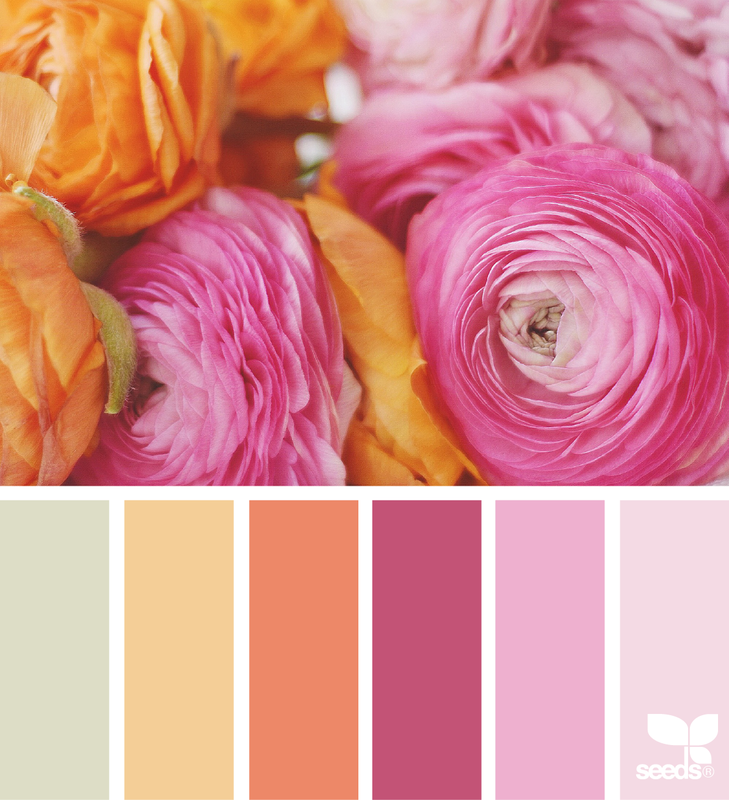 Kitty Bee Designs Challenge #88 - Color Challenge! Hi Friends! I hope you've been having a lovely week so far! I've had lots of fun creating projects lately and here's one more for you! It's time for the midweek inspiration for Challenge #88 over at the Kitty Bee Designs Challenge Blog - Aloha Friday! 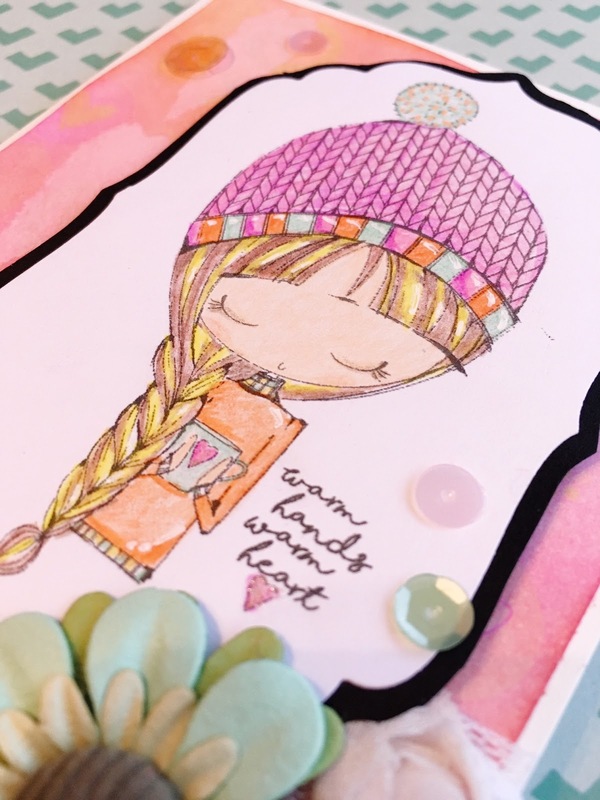 For my project this week I'm using an adorable image - Warm Hands Warm Heart from All Dressed Up that I coloured with coloured pencils. I love the look of this cozy knitted hat! I added some shading with a few darker coloured pencils and added some white gel pen for highlights. I cut her out with one of my favourite tools - my Cuttlebug, using a Spellbinders Die and then traced around the outside of the die to create a black border that is slightly larger, fussy cutting by hand. For my pink background I sponged on Distress Inks and added a row of pink stencilled hearts on the left hand side, adding a subtle effect. I grabbed some ribbon flowers, lace and a paper flower from my stash along with some lovely SpiegelMom Scraps sequins to embellish. All You Need Is Love and Coffee! Hi friends! Happy Valentines Day! I really think that sentiment sums it up ;) One of my fav things my hubby does is the awesome lattes he makes on the weekends. I don't think I could live without coffee some days! So here is the Valentines card I created for him. These Coffee Faces and Coffee Sentiments clear stamps from Pretty Cute Stamps are a couple of my favourites, and I love how many different sentiments for so many occasions are included! I started off with a piece of resist kraft printed background paper from a Tim Holtz paper pad. I used my pinks, reds and tea dye Distress Stains to colour the paper that I first had sponged with Picket Fence Distress Ink (to give it a lighter base). I love how the resist pops through! Then, I layered on a square journaling card and added some CMTH coffee stain stamps. I used the coordinating SVG files from Pretty Cute Stamps to first cut out the images with one of my favourite tools - my Cricut Explore, and then I was able to easily stamp the images before colouring with Prismacolor and Hobby Colour Markers. I added the sweet faces on after, heat embossing the white one. I added a couple diecut hearts and sequins from SpiegelMom Scraps and popped up the coffee press. These neat beans on the bottom of the card are included in the PCS coffee set. Inside, I added some extra coffee stain stamps and the I Love You A Latte sentiment from the PCS Coffee Sentiments set. The Happy Valentines Day stamp is from the Tim Holtz Crazy Talk set, and I decorated the envelope to match. Mike was very happy to get open his card this morning, and of course he got some chocolate to go along with it! We always do a little something special with the girls and they loved opening some handmade cards, chocolate and little stuffed animals. I was very lucky to get beautiful white roses, a lovely card and some yummy candy! I think making someone feel special, whether its for Valentines or any day, is something they will carry with them for a long time. Thanks for stopping by today! I hope you have a day filled with love, and of course a little craftiness! Love Makes The World A Better Place! Hey there! I'm back with a cute card I just had to share using a FREE download from Verve Stamps! Now, be quick - this download on the Verve Blog is only available until February 15th, but in case you miss it, be sure to follow their blog for digital freebies offered every so often - and you can pick up some awesome stamps in the Verve Store as well. I wanted to create a pretty card for a family member to thank them for a recent stay, and say Happy Valentines as well. I printed out the PDF download and cut out this sentiment included in the set. 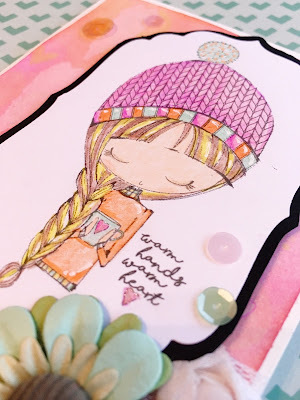 I used my Hobby Colour Markers to colour in the hearts and then added a bit of Distress Ink around the edges before layering on some patterned papers. Of course, I added some sequins from SpiegelMom Scraps! I also placed a couple drops of pink Izink ink and used my new Silver Nuvo drops - love!! 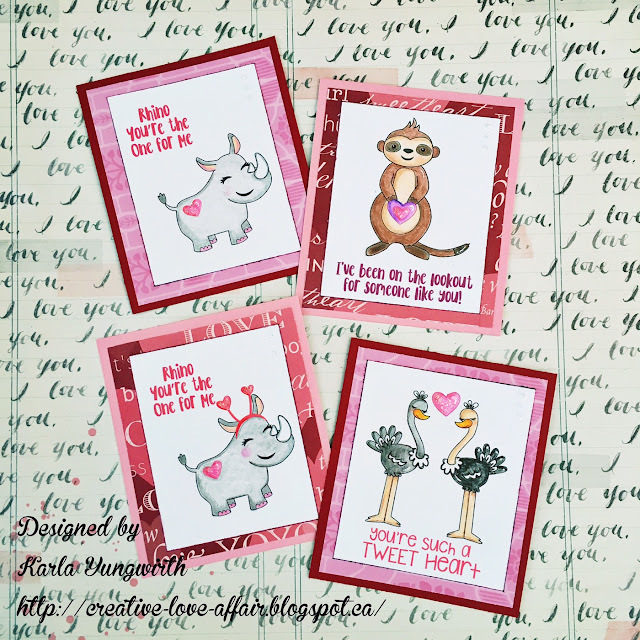 New Valentine Animals from Pretty Cute Stamps! Hello! 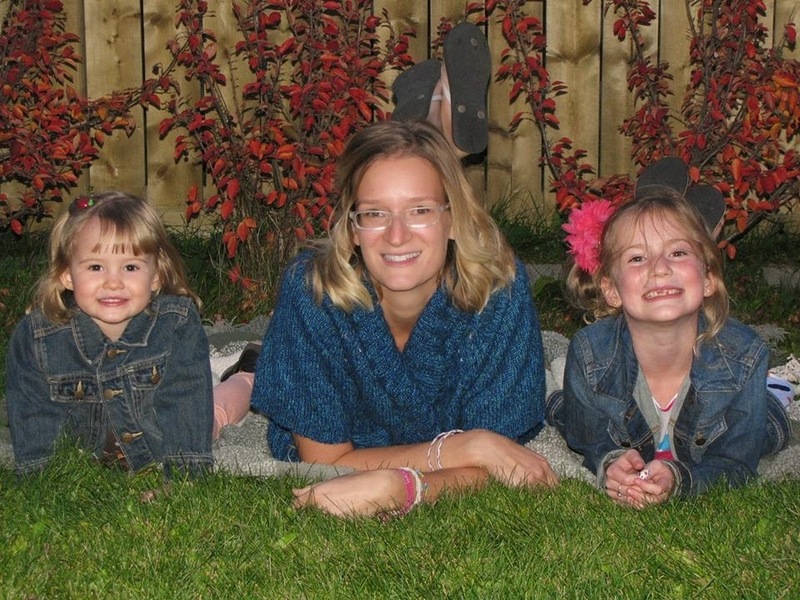 I hope you've all had a wonderful weekend :) We had a great weekend here - the weather has finally warmed up a bit, and we watched the movie Trolls over the weekend for our Family Movie night and our girls loved it!! It's so funny how many older songs are on the new kids' movie soundtracks now. I feel kinda cool knowing all the words ;) lol. We also did a bit of shopping and went swimming at our local YMCA. And, of course, I fit in some crafting! 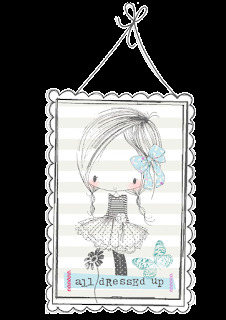 I am so super excited to share some of the new designs that Lisa at Pretty Cute Stamps has come out with!! She put these adorable images in the shop this week and I thought they'd be perfect to whip up some adorable Valentines for some little family friends. 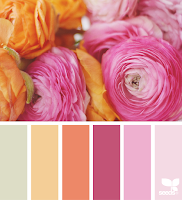 I started off by opening up PicMonkey (one of my fav tools to work with digi stamps!) and adding a white jpeg. I simply saved a project life card to my computer and use it as a base. Then, I add layers to the white background by choosing to 'add an overlay' from my computer. I choose the PNG versions of the stamps and sentiments I want to add and arrange them as desired. Using the PNG version allows you to layer the images as if you were 'masking' them in regular stamping - but way easier! You can even change the colour of the image with a click! I coloured my sentiments and printed my animals in black. I even added a second adorable ostrich to the card on the bottom right and clicked the arrow button to flip him so they were facing each other. Easy peasy! I then used my new Jane Davenport Magic Wand coloured pencils to colour in my images, adding some shading in different areas. I used these wonderful food-safe Mini Glassine Bags from SpiegelMom Scraps to fill with some Conversation Hearts and added part of a doily, some red twine and a sequin heart from the Love Beats Sequin Mix. I stamped Happy Valentines Day from the Be Mine Pretty Cute Stamps clear stamp set on the back of my cards and attached the goodies to the top of the card with a couple glue dots. 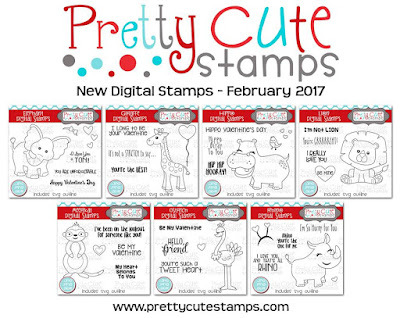 Here's a look at these amazing new digital stamps available right now at Pretty Cute Stamps! Thanks so much for stopping by!! I hope you have a wonderful Monday! SSS Monday Challenge - Fav Tool - Using the PicMonkey Program and my printer for digi stamps! Hi friends! I just love Valentines Day <3 All those gorgeous reds and pinks together with words of love! 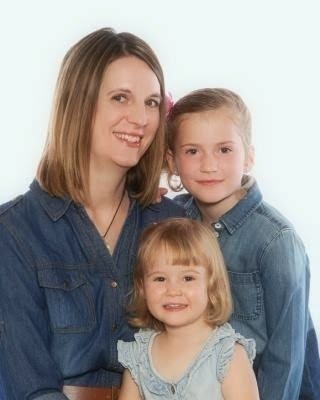 We really don't go out on Valentines Day, but rather make it a fun family LOVE day. The girls love getting Valentines and a little treat and I think it's a special day to show those around you how much you care. This year I really wanted to make some Valentines for a few special ladies in my life. I'm so thankful for all my awesome friends, and this was a small way to say thanks to a few of them! I layered some pretty papers, edged with Distress Inks, added some diecut circles stamped with these gorgeous Dina Wakely girl faces, which I coloured with my new Jane Davenport coloured pencils (love!!) and added some sequins, lace and popped up some fussy cut flowers. Ta-Da! Here's a look at the inside, stamped with an older CTMH stamp from my stash with a 'friend' sentiment on it. I used the awesome lips stamp from the Be Mine Pretty Cute Stamp set on the envelope - SWAK!! Thank you so much for stopping by! I'd love to know if you're making Valentines for your gal pals?! FCCB #294 - Valentines Day! Make a project about Valentines Day. For my Valentine project I used the Paisley Cricut cartridge - one of the first ones I ever got! - to create this cute Elephant Valentine for one of my daughters. I love making Valentines; it's something about the pretty reds and pinks mixed together and all the wonderful hearts and messages of love... <3 This little elephant looks so sweet delivering a little Valentine! It makes me remember it's worth looking through those older cartridges to find some fun cuts! I sponged around my cuts with Distress Inks and added some white gel pen and Stickles for accents. I absolutely love this Black and Ivory Love Script Reverse paper from Canvas Corp! I used Distress Inks in red and pink to sponge over the ivory coloured love sentiment - adding a lovely ombre effect! Inside, I used this pretty sentiment from a Lawn Fawn stamp set and added a couple hearts. Thanks so much for stopping by today! 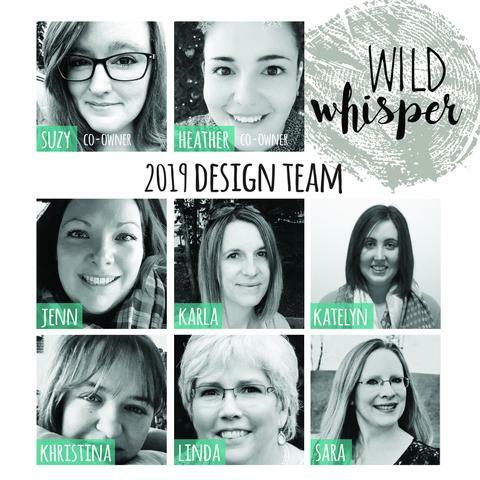 Be sure to head over to the Fantabulous Cricut Challenge Blog to see what all the other Design Team members have come up with, and enter your own Valentine project for a chance to win a wonderful prize from our awesome sponsor D.L. Art!